Experience an amazing run / hike through Hawaii's rain forest to a secret waterfalls in Manoa Valley, the valley of the rainbows. This gorgeous hike ends with a secret waterfalls in the heart of Honolulu's tropical forest with amazing sights, smells, and sounds along the way. Experience Hawaii's beauty with City Running Tours Honolulu. The Manoa Falls trail is one of the most popular hikes in the Honolulu area, mainly because it is easily accessible from Waikiki and gorgeous moderate-level hike / run through Manoa Valley (valley of the rainbows) surrounded by a tropical bamboo and rain-forest. 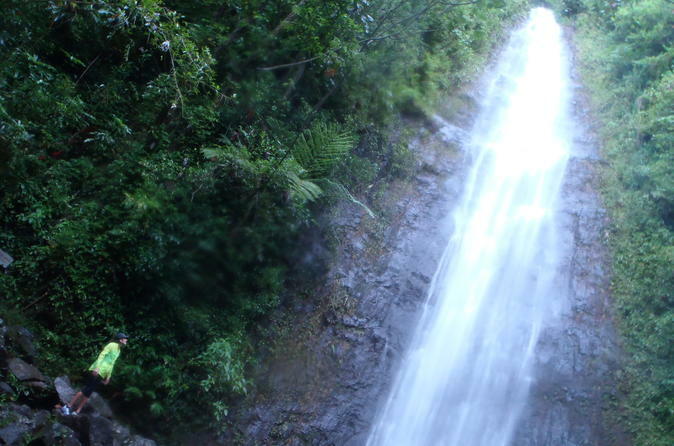 Another factor that makes the Manoa Falls trail is a favorite hiking destination for many is that its highlight, the 150-foot (46 m) waterfall awaits after a relatively easy 45-minute walk up the mountain. The waterfall is bigger if it has recently rained. Tour includes guided tour, fresh fruits, drinks and refreshments, pictures taken by your guide. Very comfortable, preferably running / hiking shoes are highly recommended.